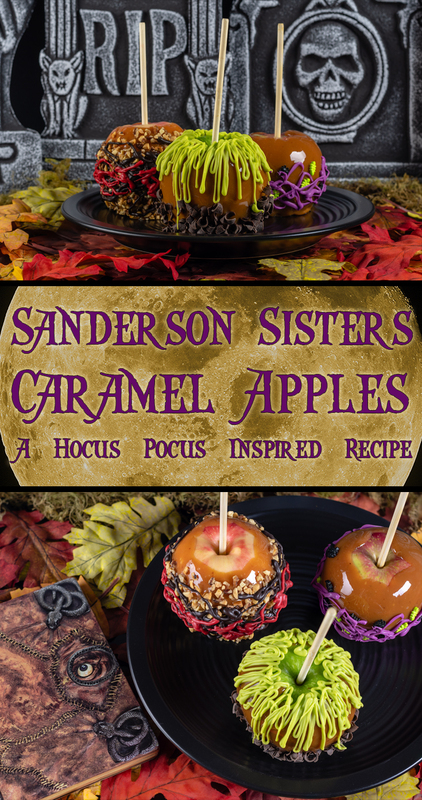 Our recipe for Sanderson Sisters Caramel Apples is a Paid Promotion for Walt Disney Studios’ Hocus Pocus. Halloween is our favorite time of the year! Usually, during this time of year, we focus on scarier films. However, we were so excited for the 25th Anniversary of Hocus Pocus that we knew we had to do a recipe for it! 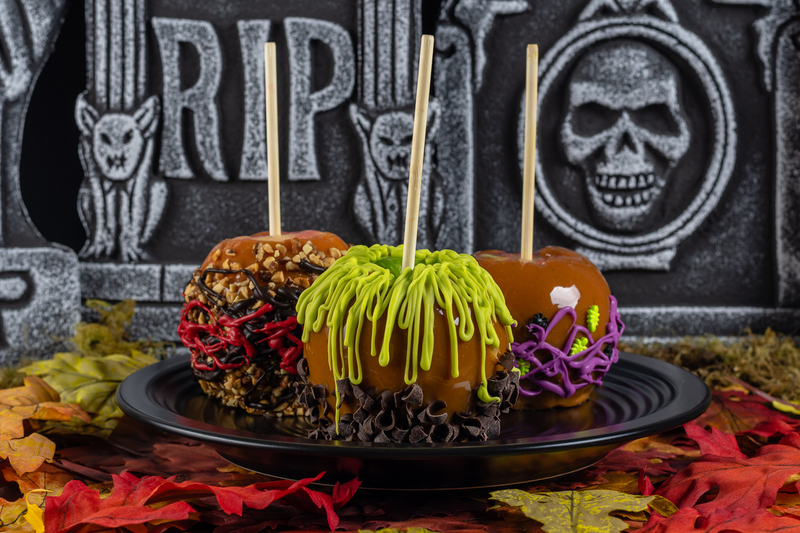 We’ve created a fun recipe inspired by the infamous sisters themselves, Sanderson Sisters Caramel Apples! 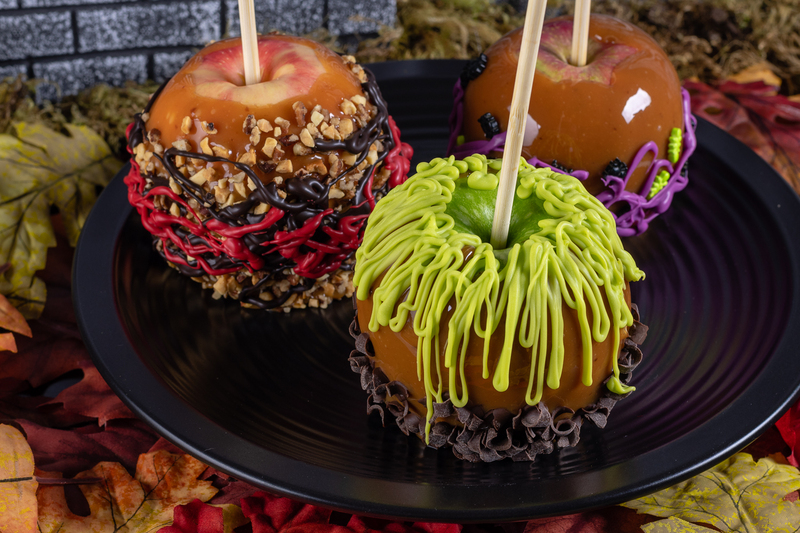 The inspiration for the Sanderson Sisters Caramel Apples came from a couple of places. First and perhaps most obvious, is the color of the Sanderson Sisters’ dresses. We also added bugs to Sarah’s since she eats them throughout the film. Mary’s has chocolate and nuts similar to the candy bars she tries. The 2nd and less obvious inspiration, is the fact that caramel apples were served at Allison’s Halloween Party. In fact, there are a ton of delicious treats in that scene! Can you spot them all? 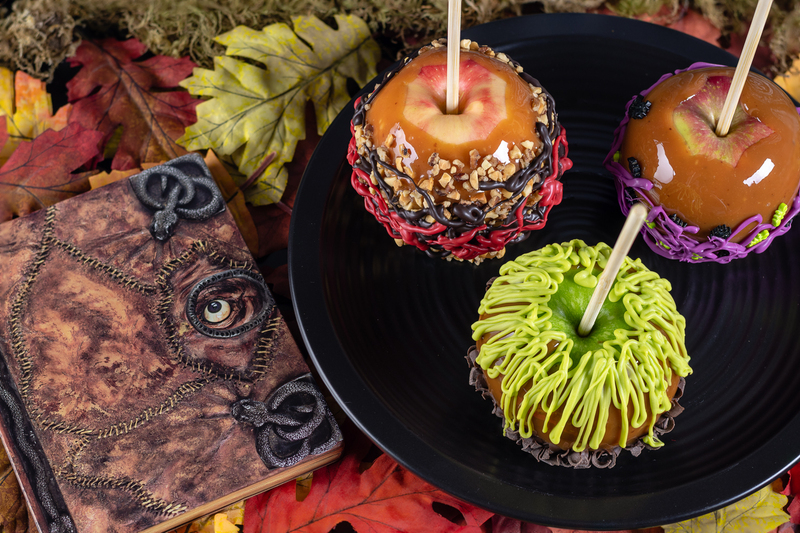 We hope you enjoy our recipe for Sanderson Sisters Caramel Apples! Be sure to pick up your copy of Hocus Pocus, now available on Blu-ray/DVD and Digital HD! Who’s your favorite Sanderson Sister? Let us know in the comments below or tag us on social media using the hashtag #GeekEats! Happy October! 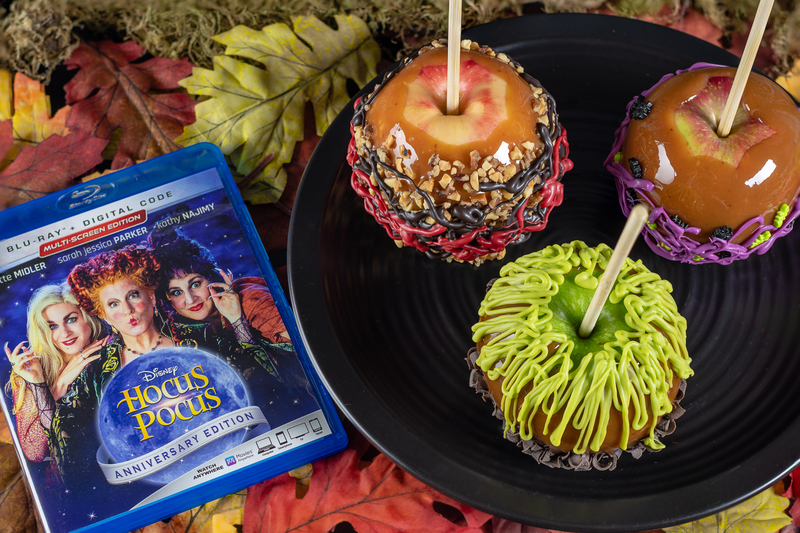 The Geeks are celebrating Halloween early with their recipe for Sanderson Sisters' Caramel Apples inspired by the Disney film Hocus Pocus! Wash apples and dry completely. Refrigerate apples for several hours until well chilled. Insert a stick into each apple where the stem would be. Put caramels and water in large glass microwaveable bowl. Heat in the microwave on high for 2 to 2-1/2 minutes (Add more time in 10 second increments if necessary until caramels are completely melted and well blended. Cover a baking sheet with parchment and spray with cooking spray. Dip apples, 1 at a time, into caramel. As you dip the apples turn them to evenly coat each apple. Continue to hold each apple over bowl until all excess caramel drips back into bowl. - Winifred- Sprinkle the bottom half of the apple with chocolate shavings. Following package instructions for the candy meltables, melt and drizzle the purple and green meltables on the top half of the apple. - Mary- Roll in nut mixture. Melt the chocolate meltables and drizzle over the whole apple. Repeat with red meltables except only drizzle around the mid-section of the apple. - Sarah- Place bugs around the apple. Drizzle with purple meltables. Refrigerate apples for about 1 hour or until caramel is firm. Remove apples from refrigerator and wait about 15 minutes before serving. *This is a Paid Promotion for Walt Disney Studios’ Hocus Pocus. All opinions are wholly our own. View our Disclosure Policy for more info.